The CAV Fuel Filter Assembly provide greater fuel injection pump protection at a significantly reduced cost when compared to almost every factory fitted fuel filter. The modern rotary fuel injection pump is lubricated by the fuel passing through it. The greater the level of contaminants (water & particles) in the fuel the faster the pump wears, eventually leading to an expensive injection pump rebuild. 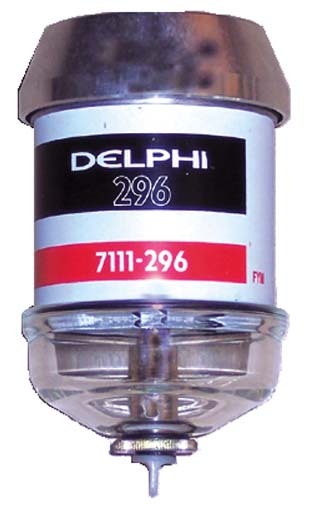 Most standard fuel filters are 8-10 micron whereas the Delphi filter is a 4micron filter. This improved filtration combined with the added bonus of a water and sediment sight bowl result in greater pump & injector protection. The cost of the replacement CAV filter cartridge can be as little as 1/10th the cost of the factory fuel filter, so the assembly often pays for itself in the first few filter changes, ignoring the future cost savings related to the extended life of the pump and injectors. The CAV cartridge is readily available and is often used on farm machinery, earthmoving equipment, transport, stationary & marine engines. The CAV Adapter is fitted using the original filter head, hand primer, brackets and plumbing. This adaptor allows fuel to travel to the bottom glass water and sediment trap first, so you can see any contaminants at a glance and drain them off before they reach the filter. CRD vehicles have a 1-2 micron filter which has a large volume of fuel passing through it at all times. Only a fraction of this fuel is actually used by the engine, most is returned to the fuel tank or pump. Fuel pressure can be 10 times that of earlier systems and the tolerances are extremely fine - hence the 1-2 micron filter requirement. Usually the OE filter will trap particles OK but are poor at holding water from the rest of the system. By the time the instrument panel warning light has illuminated, often water has passed onto the pump and injectors. The very high volume means this happens quickly. Water leads to corrosion and wear - as the fuel system components are lubricated by the fuel. 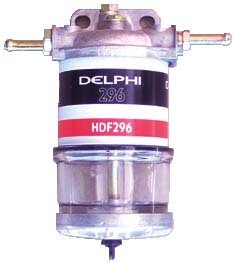 The Auxillary Fuel Filter suitable for CRD engines is recommended to be fitted AFTER the OE filter. Its primary purpose of fitting is to trap water, not to filter for particles. The element used has water resistant characteristics, any water that passes through the OE filter will he held in this auxillary filter bowl - can be drained away once the water warning light has illuminated. CRD systems will have problems (engine/fuel warning lights illuminate) if fuel flow is restricted, so the auxillary filter cannot be another 1-2 micron filter. 4WD Systems recommends use of a 10 micron unit. The Auxillary Fuel Filter suitable for CRD engines comes with a universal mount bracket and fuel hose fittings and is suitable for the DIY owner.